In January 2018, New York–based artist Jane Hammond proposed creating a new piece for HoMA’s collection inspired by her friendship with former curator of contemporary art, James Jensen, who passed away nine months earlier. Jensen had curated Hammond’s first museum show at what was then the Honolulu Academy of Arts in 1989, and later brought an exhibition of her work to The Contemporary Museum (now HoMA Spalding House) in 2002. The work, All Souls (Pahala), is now on view in the exhibition In the House: Recent Acquisitions at Spalding House. Hammond is known for her paintings, collages, and prints incorporating a wide array of images, often collected from vintage sources, including astrology charts, medical and technical illustrations, natural history books, and advertisements. Her works are inspired by poetry, literature, music, travel, and her dreams. The series All Souls, of which HoMA’s work is a part, began after the 9/11 terrorist attacks, when she dreamed of a map of the Middle East covered with butterflies. Completed in September 2018, the piece includes images of a variety of butterfly species based on specimens Hammond buys from butterfly farms. The specimens are scanned and the images printed on archival double-sided paper. Using manicure scissors, she cuts out the wings, then paints the raw edges. The insect bodies are made from rolled-up rice paper onto which she attaches horsehair antennae. 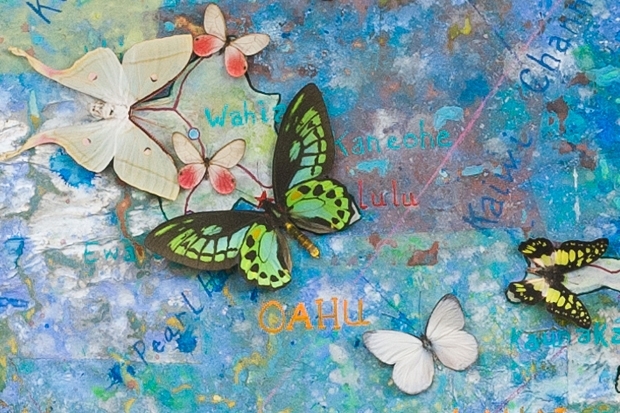 The paper butterflies are then layered on top of a map, in this case, the Hawaiian islands surrounded by the Pacific Ocean. 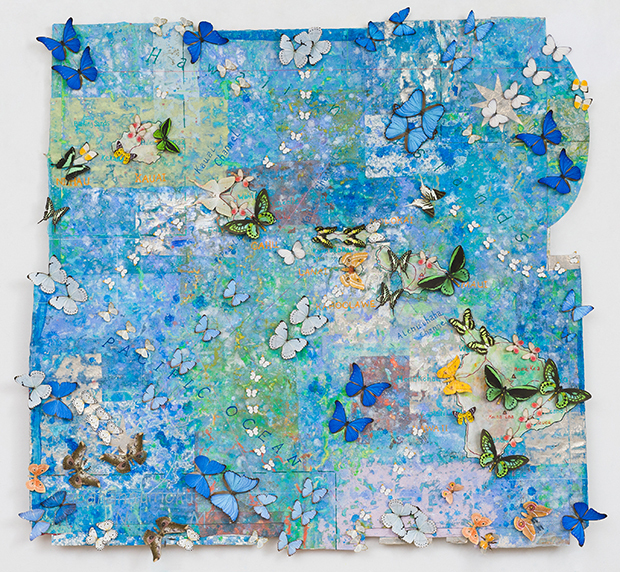 Some of the butterflies are individually scattered across the work, while others are paired up or appear to follow each other single file, forming directional pathways across the surface of the piece. Place names can be deciphered and appear in yellow, blue, and red lettering. The titles of the All Souls series generally reference a small city or town that caught the artist’s attention during the process of making the work. All Souls (Pahala) is named after a location near the southern coast of Hawai‛i Island. In the House features a selection of contemporary works recently acquired by the Honolulu Museum of Art. To properly care for and preserve the collection, light-sensitive materials such as works on paper and those made from natural fibers or dyes may only be displayed for a limited period of time. All Souls (Pahala) is on view through May 19. The acquisition of this work is made possible by Jane Hammond, with support from Sharon Twigg-Smith.